This is one graphic novel with a message that seeks to dispel the myth of the subversive computer hacker out to cripple the world, although whether the target audience is the child growing up in the age of technology or their parents is not always clear. 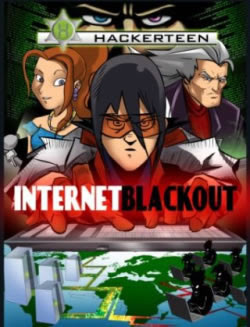 HACKERTEEN: INTERNET BLACKOUT centers on a main character, Yago, who is first seen cloistered as a 12-year-old in a room lit up by the computer screen. His worried parents shout for him to get off the computer, to little avail. Yago skips school so that he can play computer games and lies about what he is doing. Finally, Yago's parents bring him to a fictional organization called Hackerteen, where martial-arts-style instructors teach the young boy the ethics of using his skills for good, and not for evil. But evil lurks anyway, and as he grows up, Yago is caught up in conflict between using technology skills for nefarious reasons or for improving life. This dilemma comes to a head as the government releases a computerized balloting system for elections that requires voters to submit a genetic sample for verification. HACKERTEEN: INTERNET BLACKOUT is told at a brisk pace – almost too brisk. The plot can be confusing to follow, as Yago uses his considerable abilities to help his father's bakery business survive in the face of corporate expansion, a blackmail plot is launched against a girl with a webcam, a new law sends an adult hacker into jail, Yago's friends compete to solve a hacking code in a contest, and Yago's freelancing for customers seeking to catch others in cyber-lies leads to a fateful turn of events that pushes the entire network of the Internet into the brink of collapse. The story would have benefited from a narrowing of the story lines. The story is published by O'Reilly Media, which has long been at the forefront of the open source movement and the ethical use of technology. So the overarching theme of the book is no surprise and it is an interesting one to explore. As this is the first in a series of HACKERTEEN: INTERNET BLACKOUT, perhaps Marcelo Marques, the author, wanted to create a web of plot lines that could be followed in later books. It also should be noted that the Hackerteen concept is also a web-based education site for parents and kids to learn more about ethical use of computers, and it sometimes seems as if the book is an advertising supplement for the website. The illustrations work in tandem with the story and are expressive in colors and design. The characters are drawn somewhat stereotypically. For example, one of the bad guys looks quite odd and scary, with a too-short t-shirt that rides up his belly in a disconcerting way. The teenage heroes are dressed in cool, techie clothes, with Star Trek-like glasses. Yago and his friends are the stereotypical geeks in all ways, which is not a bad thing in a graphic novel like this. I would recommend this for middle school and high school students. The book provides a good rationale for ethical use of technology. There is no profanity or violence in this book.